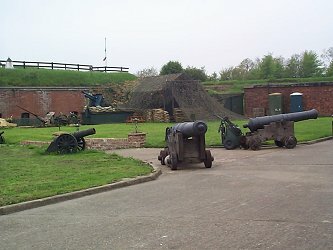 The first gun battery, known as Paull Cliffe Battery, was built in 1542 to protect the entrance to the Humber and Hull. It was rebuilt in 1808 during the Napoleonic War but was dismantled afterwards in 1822. The current building, Paull Point Battery, was built between 1861 and 1864 as part of the Palmerston defences of the major ports and it was used until 1960 when it was sold. It was a five sided design armed with 19 guns and surrounded by a dry ditch next to the River Humber. By 1900 it was armed with 5 of the latest 5" and 6" BL guns. It is operated now by the Fort Paull Visitors' Centre and Armouries Museum. Open 10 - 6 daily, with car park.